Good afternoon. Today I would like to give some information regarding Rinpoche’s health. We all know that Rinpoche has experienced a kind of obstacle during his return trip from India to France. Arriving back to Ganden Ling, France, he experienced uneasiness, a kind of coughing, and later was rushed to the hospital. After checking, one unfortunate situation was discovered, Rinpoche had had a heart attack. Although it was a mild one, but for an eighty three year old man to have a heart attack is still not a good news. Apart from that, Rinpoche also suffered some breathing problem. Fortunately, today he already can sit in a chair and for the next few days he can return home and then he will go to some place to have a long rest. That is about Rinpoche’s news. Related to the schedule, all the schedule has already been revised. We will need to cancel the teaching and initiation at Jakarta. Meaning, there will be no schedule for teaching and initiation, these two programs are cancelled. As for the Bandung program, it will be very good if we organize a prayer ritual joined by a lot of people, dedicated for Rinpoche’s health and safety. In buddhist tradition, things like these are very common, i.e. all the disciples gather to pray for the guru’s health. I hereby propose that we should all gather together in December, taking part in a ritual dedicated for Rinpoche’s health–this year he is 83 years old. We have already done this sort of ritual, some two years ago. From us here we have already planned that this sort of ritual to be held next year, but since now it happens that Rinpoche cannot be here with us, therefore it would be very good if we as disciples can offer something to the guru. The prayer ritual will be more or less the same as the previous event, however this year it will be a little bit different on the part of the Tibetan puja. The main point and purpose is for us to generate a tremendous huge amount of merit, together with as many people as possible participating, the more the better. As a matter of fact, we do not only do ritual, but earlier this year we have tried to accomplish virtuous activities, one of which is producing stupas. The Dharma Protector has given his advice two years ago when we all went to Kullu, that we should construct Stupa for Rinpoche’s health. Right now in Kullu we already have two stupas erected and in Indonesia we here agree to collectively produce 100.000 stupas like this. But due to the time, weather, and some other obstacles, we only manage to produce around 3,500 to 4,000. Therefore, I sincerely propose that together we can accomplish the completion of these 100,000 stupas. Why stupa? Stupa is the mind of all the Buddhas. We hope with this great mind our merit can be increased tremendously. Stupa can also function as a cause for us to always have a spiritual master. Apart from stupas, we also gather 10 million candle lamps to be lighted for many many years, non-stoppingly, so the guru will always be present around us. I sincerely hope that together we can accomplish these 3 activities which are solely and wholeheartedly dedicated for Rinpoche’s health, which in turn for our own good, together, collectively. It is important for us to be part of this December event because our presence is a sign of our effort, which imbued with good motivation and eventually all the efforts combined will create a perfect merit for all of us. 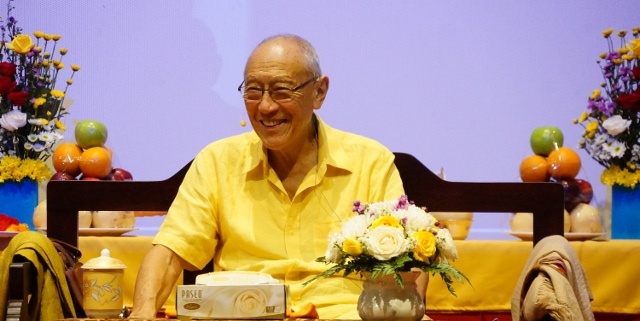 I sincerely hope that everyone who has a strong heart and mind connection with Rinpoche, our guru, that together we can reflect on the fact that we really need to do something for Him.